ባለፈው ዓመት ግንቦት ርክበ ካህናት ቅዱስ ሲኖዶስ ምልአተ ጉባኤ ሃይማኖቱ እና ሃይማኖተኝነቱ ጥያቄ ተነሥቶበት የምልአተ ጉባኤውን አባላት ያከራከረው ጌታቸው ዶኒ፣ ከፕሮቴስታንት የእምነት ተቋማት ጋራ ያለው ያልተገባ ግንኙነት በማስረጃ መረጋገጡ ከተነገረና፣ ፓትርያርኩ ያለ ሲዳሞ ሀ/ስብከት ሊቀ ጳጳስ ዕውቅና የሀ/ስብከቱ ሥራ አስኪያጅ አድርገው ከሾሙበት ሥልጣኑ በሐዋሳ ምእመናን ጠንካራ ተቃውሞና በምልአተ ጉባኤው ውሳኔ ከተነሣ በኋላ በጠቅላይ ቤተ ክህነት የገዳማት አስተዳደር መምሪያ ምክትል ሓላፊ ሆኖ መሾሙ ይታወሳል፡፡ ይሁንና ከፓትርያርኩም ይሁን በዙሪያቸው ከተሰለፉ ሕገ ወጥ ግለሰቦች ራሱን ማግለሉን ሲነገርለት የቆየው ጌታቸው ዶኒ አሁን ቪላውን ለማስመረቅ ፓትርያርኩን መጋበዙ፣ ፓትርያርኩም የቁርጥ ቀን ወዳጃቸውን ጥሪ ሳይንቁ መገኘታቸው አነጋጋሪ ሆኗል - ጌታቸው ዶኒ ለ18ኛ ዓመት በዓለ ሢመታቸው ላሠራላቸው ሐውልተ ስምዕ ውለታውን ለመመለስ፣ በዚህ ዓመት በልዩ ሁኔታ እንዲከበር ‹ተወስኖ› ከወዲሁ እንቅስቃሴ ለተጀመረበት 20ኛ ዓመት በዓለ ሢመታቸው ‹የላቀ ትብብሩን› የሚጠይቅ ፈለማ/ቅድሚያ ለመያዝ ይሆን? Guys, please leave Abba Paulos. He is old man and he couldn't do anything as well as expected people. Dear anonymous, Abune Shinoda is old too but you know what he does for his church right? "Enanete worobelawoch, leave me alone, MONEY TALKS. Let me enjoy. Ahune yehe keAserahute hawoletea yebeltale? Atenchachu, Synodosme alechalegne!" 1. I think aba poaulos should say it is enough for him as a patriarch and just be away from administration and be by himself to pray, to fast ,to repent save himself .It is not good for him tobe a leader and be bad model for the church and make the churche's value, people's strength to lose trustfulness. 2. This is a big strategy by tehadiso and other menafikans. we know it aba ,you feel as if you are leading smartly. you are hiding from meki miimen ,could you hide in front of God either now or when you die. 3. Prevoiusly I was blaming aba paulos but now I am really and deeply sad and start saying he will be in hell and I wish him to be better and live true christianity and repent. 5.how many times you hide from people and lie to yourself and to God always all in your life . Do you feel happy while you do this in all your life. money will not make you satisfy ,please be with yourself listen to your internal hilina/mind. leave them and go hide somewhere and pray for them too. [ዓለም ጤና አካባቢ] and መቂ ከተማ መግቢያ are in different direction. The first is in west addis and the later in south/south east? 1.5 million birr, how can a priest have that much money? I do not even know this priest,never heard his name but that amount of money, it raises doubt.The priest spirituality is questionable. How come you say "... ፓትርያርኩ የጌታቸው ዶኒን ቪላ መመረቃቸው ከመንፈሳዊ አባትነታቸው፣ ከቀረቤታቸውም አኳያ የሚጠበቅ ቢሆንም...". Rather the Patriarch could have asked Getachew 'how could he build a 1.5 million villa with his mingling salary?' That clearly indicates he did it by corruption. And this shows Aba Paulos supports corruption in a day light. Question to Dejeselam, is Getachew a 'monk' or 'married priest'? Is he is a monk.... then Aba Paulos encourages monks to build personal buildings.... so sad. i'm always surprised with Dejeselam for it brings Newest news for us. thank you !! may God gave your pay in his coming Heaven. i heard one holy fathers says when a papas made wrong let a girl correct him. So i call for all those who can correct him from his way. with the help of pray and daily advice. may God help you so that we can hear good news about our church. ene yegeremegi ye muslim ena protestant min lihonu new orthodox cherch mirikat yehedut algebagim? Where is the so called "Ethics and Anti Corruption Commission"
The PM, as he confirmed us, earns 6,000 and after deductibles made he is gonna receive nearly 4800. Does this worth to build a million Birr VILLA? firms build such first class VILLA? he have that can make him boast about VILLA? WHERE IS THE SO CALLED ''ETHICS AND ANTI CORRUPTION COMMISSION? 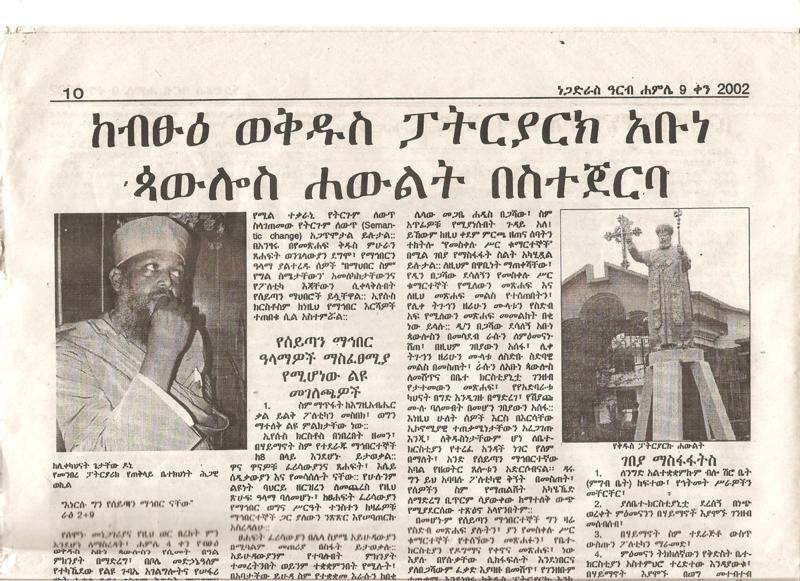 Abune Paulos is one of Getachew Doni's leader so it's obvious that they are doing their best to stop the growth of Tewahedo Church with the help and unconditional fund from Protestant church. All we have to do is to opose Abune Paulos where ever he goes, we should say no to his autocracy leadership. 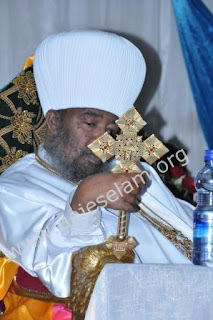 If the holy synodos does not do it's job the christians will do theirs let us all push towardes fighting Abune Paulos every where he goes, not only him his followers Aba Gerima, Aba Fanuel, Aba Sereke, Getachew doni, and not forgeting Begashaw and his gang group as well. ሰላም ደጀሰላሞች ጠፍታችሁ ጠፍታችሁ ብቅስትሉ ይሄንንኑጉደኛ አባት ይዛችሁብቅአላችሁ እኔየሚገርመኝ እኝህሰውየ አሁንም ልባቸውአልተመለሰም እንደውለመሆኑ አቡነሽኖዳን ሲያዩዋቸው እኔስ እራሳቸውን ይመረምራሉ ለስከዛሬውም ንስሀይገባሉ ብየነበር ምክንያቱም ድፍን የግብጽ ክርስቲያን ካዋቂእስከጻን ተገኝቶ ለኖላዊ እረኛው ያለውን ትልቅፍቅር እንዲያበእንባና በልልታ ሰገልጽ እኔ(የኔስ ባእለሲመት) ቢሆን ብለው እራሳቸውን ቢጠይቁ የሚያገኙ መልስ የሚያስፈራ የሚያሳፍር አንገት የሚያስደፋ እንደሚሆን ሲያስቡ በቀራቸው እንጥፍጣፊ እድሜ ለንስሀ የሚያተጋቸው ጥሩቶርች ነው ብየ አስቤነበር ለዚያውም አላግባብ ሁለት መቶ ሽብር ለጎረቤት ሀገር ለግብጽ ትራንስፖርትና መዝናኛ ማውጣታቸው እንዳለሆኖ ግንሳ እሳቸው እቴ ያዳቆነ ሰይጣን እንደሚባለው እየባሰባችው ነው የሚሄዱት እርሱመድሀኒአለም ፍርዱን ይስጠን እንጅ ያስፈራል መጭውን ማስቡ! ለምን ይመስላችኋል ይህ ሁሉ ክፉ ነገር የደረሰብን? Egna gin besinfina ena dikimetachin yametabin fetena new. 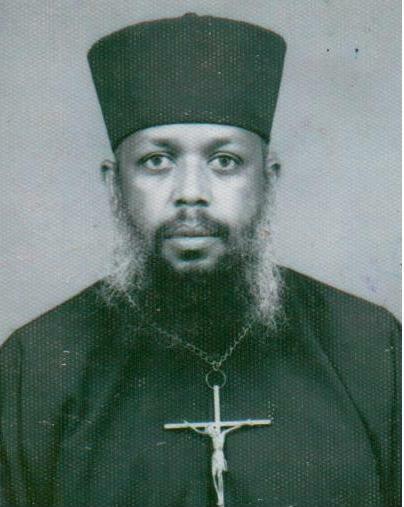 Menekosat ena yebetechristian astedadariwoch villa eyasmereku, patriarch yegileseb bet mirikat lezawum beminet bemitereter sew bet. Keyet amtito aseraw new tiyakew. Egziabher bizegeyim ayikerim. Menshun yanesal. Lehulum gizie alew. Egna gin yedirshachinin eniwota. Hulum beyeatibia betechristian tenkiro mesirat alebet. Brothers and sisters in Christ, please let us be strong in preying and to defend our church in whatever it is possible. Ken ena lelit lebetu mesirat yalebin seat new. Egziabher amlak birtatun yadilen. መናፍቁ አንተ የተሀድሶ ልሳን አይደለህ እንዴ? አንተስ ከመናፍቅ ልሳን ጋር ትመጋገብ የለ እንዴ? እንቁ ከደጀ ሰላም ጋር አንድ አይነት ነገር ስለፃፈ የማህበረ ቅዱሳን ከተባለ በራስህ ሂሳብ ነጋ ድራስ እና ማራኪ የተሀድሶ ናቸው ማለት ነው? this is a trash story.Good for nothing!!... I don't want to lie,I never saw/read any thing biblical in this website...hamet,were... manin asadege... ebakachihu wede nefsachihu temelesu? !---How come a religious site goes down this deep? As you said defaming, insult and judging others is not a spiritual act. But what dejeselam is doing is that unraveling the realities about the Patriarch and Getachew Doni and awakening the fellow orthodox tewahedo people. Ende ergib yewahoch hunu gin demo endebab libamoch hunu tebilenal. We cannot sit idle and kept only preying while the church is embuzzled and encroached by others. God will help us only when we are doing our part. I accept your comment about avoiding some irrelevant words in mentioning the Patriarch. But, I encourage Dejeselam to bring these types of news to the public as these are crucial for our further movements. If you are a real tewahido person, donot get disappointed and disturbed by what is happening. This is part of christian life. it is a way to the cross and can't never be always a comfortable way. If you are from Tehadiso, you better prey and come back to your mother church. Apart from that, tehadiso protestant groups are being arrested because of these information exchange and we are now in a real preparation for more defense at different levels of the church. We have to make our level best to solve the problem of protestantism from the top (tekilay betekihinet) to individual church levels. We are also hoping the backups of the government in solving the real dangers of our church and the consequent national chaos. If not we will keep on struggling with the help of God. Egziabher kegna gar kehone man yashenifenal. የአትትዎ ለኀጥእ ከመ ኢይርአይ ስብሐተ-እግዚአብሔር! አያችሁ ገብርኤል ጀግናው ቤቱ እንዳይረክስበት ሲጠነቀቅ?